Hyundai has signed a content partnership deal with YouTube channel Copa90 to capitalise on its sponsorship of the 2014 FIFA World Cup. The partnership builds on research by YouTube that said that 10.4 million football fans are online and 4.5% of them are heavy YouTube users. In the build-up to the World Cup, Copa90 is running a series of programmes that review the 12 host cities, while it will run an interview series during the tournament itself. 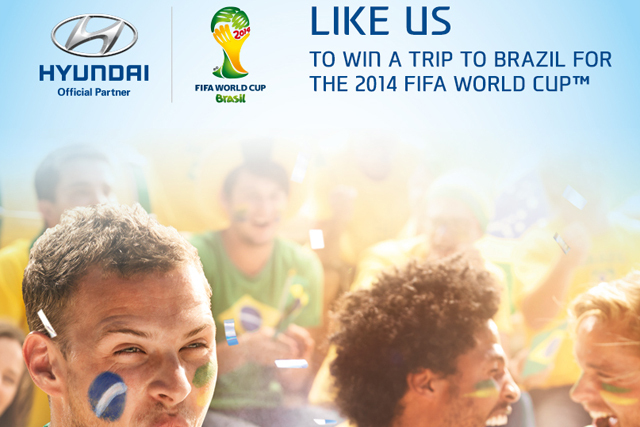 The Hyundai competition will encourage fans to recreate their favourite goal celebrations and enter them online, to gain a chance to win one of seven pairs of VIP packages to see Brazil versus Mexico on 17 June. Hyundai has produced a launch film to explain the competition. Andrew Cullis, Hyundai’s marketing director, said: "Our long-term partnership with FIFA allows us to connect fundamentally with a passionate global audience. "For this year’s 2014 FIFA World Cup Brazil, we wanted to further improve that connection by working with Copa90 to bring engaging content and an exclusive competition to enhance the fans’ experience of the tournament – bringing a bit more of Brazil to Britain."